One of the most private decisions a woman can make, abortion is also one of the most contentious topics in American civic life. Protested at rallies and politicized in party platforms, terminating pregnancy is often characterized as a selfish decision by women who put their own interests above those of the fetus. This background of stigma and hostility has stifled women’s willingness to talk about abortion, which in turn distorts public and political discussion. 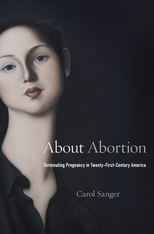 To pry open the silence surrounding this public issue, Carol Sanger distinguishes between abortion privacy, a form of nondisclosure based on a woman’s desire to control personal information, and abortion secrecy, a woman’s defense against the many harms of disclosure. Laws regulating abortion patients and providers treat abortion not as an acceptable medical decision—let alone a right—but as something disreputable, immoral, and chosen by mistake. Exploiting the emotional power of fetal imagery, laws require women to undergo ultrasound, a practice welcomed in wanted pregnancies but commandeered for use against women with unwanted pregnancies. Sanger takes these prejudicial views of women’s abortion decisions into the twenty-first century by uncovering new connections between abortion law and American culture and politics. New medical technologies, women’s increasing willingness to talk online and off, and the prospect of tighter judicial reins on state legislatures are shaking up the practice of abortion. As talk becomes more transparent and acceptable, women’s decisions about whether or not to become mothers will be treated more like those of other adults making significant personal choices.